“If the Crown pays income tax, that makes us like everyone else. And we’re NOT like everyone else. That’s the point of us,” fumes Queen Elizabeth II to Prime Minister John Major, in Peter Morgan’s powerfully inventive play, The Audience. Having won virtually every accolade given for screen acting, including the Academy Award for Best Actress, for her portrayal of Elizabeth II in the 2006 film, The Queen, which was written by Mr. Morgan, Helen Mirren is again playing this monarch, now on the stage. This play was originally produced in London’s West End in 2013. Ms. Mirren was awarded The Olivier and Evening Standard Award as best actress. She is repeating this acclaimed performance on Broadway with a cast made up of actors from the London production and newly selected Americans. With star quality, crisp authority and sheer talent, she compellingly portrays Elizabeth II from her ascension to the throne at the age of 25, to the very present with references to President Obama. That the play’s structure is nonlinear makes her performance even more remarkable. With the clever usage of varying wigs and costumes, transformations between alternating ages astonishingly take place on stage without a pause. These vignettes aid greatly in depicting the passage of time, though it is Ms. Mirren’s assured voice and charismatic presence that make this conceit truly successful. She is extraordinary. Her vivid characterization of this living historical figure has visual accuracy and abundant emotional range and depth. Displaying joy and sorrow at appropriate times, she always reveals the strong inner core that serves her well during many conflicts. In Frost/Nixon, The Queen, and other docudramas based on contemporary history, Mr. Morgan creatively explored factual scenarios that selectively focused on specific events. 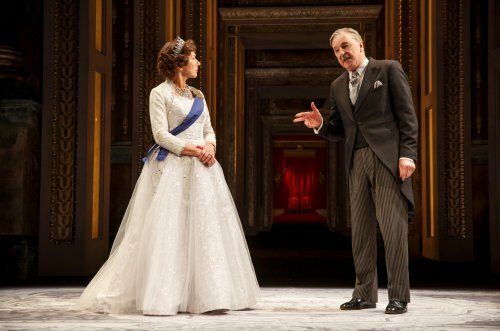 He has adeptly gone even further here, by covering over 60 years in dramatizing the life of Elizabeth II through her relationships with nine of the 12 prime ministers who have served during her reign. These real life personages are all rendered with factual precision. Morgan creates an exciting panorama of 20th century British history that presents events simply, without getting bogged down. For example, The Suez Crisis of 1956 is explained with informative brevity. As in his previous works, his imagined dialogue is wondrous, witty, and has the air of authenticity. The play has been so successful that a return engagement is set to open shortly in London with Kristin Scott Thomas in the leading role. “Every week The Queen of The United Kingdom has a private audience with her Prime Minister. It is not an obligation. It is a courtesy extended by The Prime Minister to bring Her Majesty up to speed. The meeting takes place in The Private Audience Room located in the first floor of Buckingham Palace,” explains The Equerry, a Lieutenant-Commander LVO Royal Navy, at the beginning of the play. He appears throughout, as a major-domo/ narrator figure. He is winningly played by the erect, mature Geoffrey Beevers with dry understatement. When not drolly addressing the audience, he is often communicating with The Queen with warmth. Mr. Beevers is one of five members of the original London company to reprise their roles in this production. 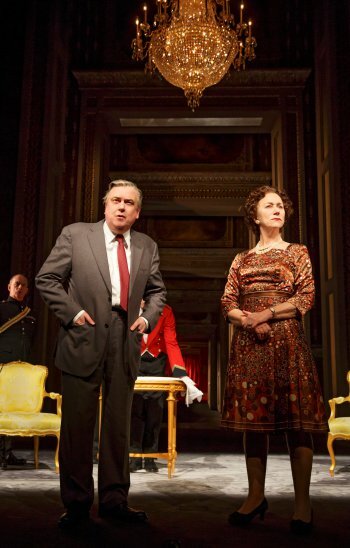 Another is the splendidly garrulous Richard McCabe who portrays the Queen’s favorite prime minister, Labor’s working class Harold Wilson. They have three scenes together, more than any of the others. Their playful bantering (“There’s a good union woman in there somewhere”) are among the show’s most delightful highlights. The charming Mr. McCabe won The Olivier Award for supporting actor for this role and it is easy to see why. With her trademark coif, regal bearing, purse and fashionable ensemble, Margaret Thatcher is superbly depicted by the sensational Judith Ivey. She crisply recreates that imperious voice and condescending attitude supremely during her chilling confrontation with The Queen. “I am an old man. Many have questioned my relevance. Whether I still have something to offer in public life. The answer is I HAVE,” says Winston Churchill, the first of the prime ministers Elizabeth meets with. Dakin Matthews poignantly delivers an outstanding portrait of the wily grand old man feistily clinging to power while physically and mentally fading away. Also from the London cast is Rufus Wright as the gregarious David Cameron and in a wicked cameo as Tony Blair as well. Dylan Baker is a wonderfully dithery John Major. Michael Elwyn offers a somber glimpse of the out of touch and doomed Anthony Eden, the role he created in the London production. Rod McLachlan blusters engagingly as the troubled Gordon Brown. Another effective and moving temporal dimension is the inclusion of flashbacks of Elizabeth as a child existing in her older self’s memory, and of conversations between the two. At the performance attended, Sadie Sink (alternating with Elizabeth Teeter) excelled as the prematurely mature Young Elizabeth. Besides eliciting towering performances from the cast, director Stephen Daldry conjures up dazzling stagecraft, giving the play an epic brilliance. The quick changes, cunning placement of the actors, striking picturesque tableaus, aesthetic utilization of the imposing scenery, along with live corgis running around on cue, all combine into a highly expressive realization of pure theater with cinematic flourishes. A fantastic sequence is that of the spectacle of the Queen’s coronation in 1953. Bob Crowley’s colossal scenic design includes an amazing recreation of Buckingham Palace with shifting spatial relationships emphasizing its huge scope, and topped with an elaborate chandelier. There is also his stunning panorama of the Scottish mountains for a scene at Balmoral Castle and an outdoor picnic there. Mr. Crowley is also responsible for the lavish and simple creations presenting of The Queen’s wardrobe over the decades, and of the historically accurate costumes for the acting ensemble. Rick Fisher’s lighting design artfully achieves the subtle and bold evidence of the passage of time, as well as emphasizing the emotions that are occurring. Paul Englishby’s royal music evocatively sets the requisite moods and tones. Sound designer Paul Arditti has seamlessly melded the musical score with all of the other sound effects. Much of the successful temporal and physical metamorphoses of The Queen, and a number of other recurring characters, is due to the impeccable hair and make up design of Ivana Primorac. Helen Mirren’s monumental performance, Peter Morgan’s accomplished writing, Stephen Daldry’s stupendous direction, and the high caliber of the production make The Audience an exhilarating and memorable theatrical experience.